Russian lawyer; born at Kamenetz, Podolia, 1837; died at St. Petersburg Jan. 16, 1894. In 1863 he went to St. Petersburg, where he devoted himself chiefly to law. In 1871 he graduated at the university there, and in 1877 became an advocate in the circuit court of justice. 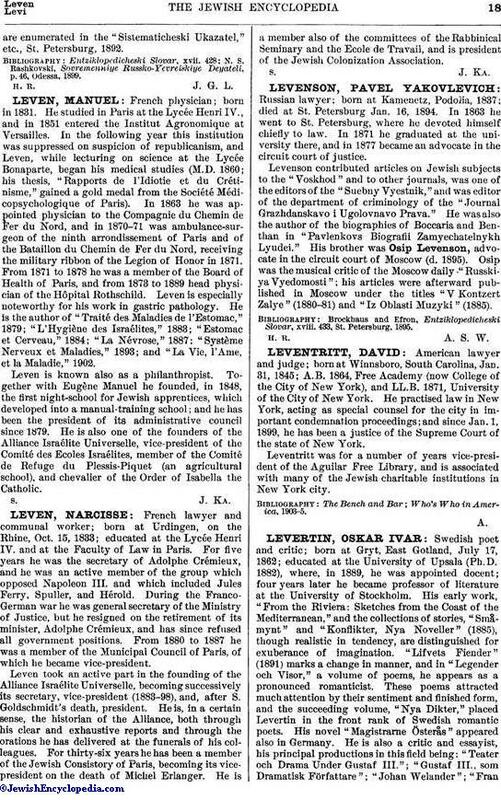 Levenson contributed articles on Jewish subjects to the "Voskhod" and to other journals, was one of the editors of the "Suebny Vyestnik," and was editor of the department of criminology of the "Journal Grazhdanskavo i Ugolovnavo Prava." He was also the author of the biographies of Boccaria and Benthan in "Pavlenkovs Biografii Zamyechatelnykh Lyudei." His brother was Osip Levenson, advocate in the circuit court of Moscow (d. 1895). Osip was the musical critic of the Moscow daily "Russkiya Vyedomosti "; his articles were afterward published in Moscow under the titles "V Kontzert Zalye" (1880-81) and "Iz Oblasti Muzyki" (1885). Brockhaus and Efron, Entziklopedicheski Slovar, xviii. 433, St. Petersburg, 1895.